The Bureau of Applied Social Research (BASR), known as ‘the Bureau’ to those who worked there, played an influential role in early media studies and the development of communication as a discipline. Founded in 1937 as the Office of Radio Research (ORR), the Bureau (renamed in 1944) was a research institute affiliated with Columbia University but dependent for funding on external sources. It was one of several such research institutions formed by Paul F. Lazarsfeld, a Jewish-born Viennese émigré scholar, trained as a mathematician and social psychologist, who became a major figure in the history of the study of communication. He founded the ORR with Princeton University’s Hadley Cantri, and help from his second wife, Herta Herzog (who would play a major role in research conducted there). Shortly after the founding of ORR, Cantril and Herzog worked together on The Invasion from Mars, a famous study of the panic caused by Orson Welles' 1938 The War of the Worlds radio broadcast. It was one of the earliest extensive studies of the experiences of a radio audience (and based on interviews conducted mostly by women). Lazarsfeld moved the ORR from New Jersey to Columbia in 1940, aided by his ally there, the sociologist Robert S. Lynd. Lazarsfeld’s institutes were intellectually vibrant places that were often on precarious financial footing. 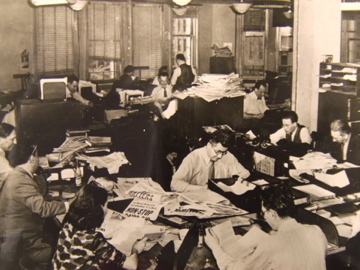 In its early days at Columbia, the ORR/Bureau served several purposes—conducting research related to Lazarsfeld's interests in decision making and social scientific methodologies, training graduate students, and generating enough money to keep the place afloat and employ the fellow émigrés and women who did much of the work. Herzog worked as Associate Director of the ORR until she left in 1943 to become a director of research at the advertising firm McCann Erickson. By then, Robert K. Merton had joined Lazarsfeld on the sociology faculty at Columbia and had been enlisted at the Bureau as well, thus beginning a collaboration that lay foundations for the mainstream of American sociology in the postwar era. In 1944, Lazarsfeld and Merton brought C. Wright Mills to the Bureau, a larger-than-life Texan whose eloquent books of the 1950s helped inspire the student New Left several years later. In the late ‘40s and ‘50s Mills and Lazarsfeld would break, pursuing very different visions of sociology, and playing out a drama that foretold the political and epistemological fissures between critical and objectivist research that opened in the late 1960s. Admist the sizable male egos, dozens of women worked at the Bureau in roles that ranged from Herzog’s associate directorship to positions as research associates, interviewers, coders, stenographers, and secretaries. Some of these women were enrolled as graduate student, a handful of which would go on to get Ph.Ds although job prospects were grim for finding positions beyond the level of lecturer in American universities. Other women followed Herzog and pursued careers in the commercial sector where they applied skills cultivated at the Bureau to advertising, marketing, and public opinion research. During the 1940s, these women collectively wrote or made important contributions to a number of media-related studies, including four classic books: The People’s Choice, Voting, Mass Persuasion, and Personal Influence. Two addressed voting behavior, one a celebrity entertainer’s radio war bond marathon, and the last patterns of social influence and their relation to communication. All have been influential and are still cited today—and all were made possible by the work women were doing in these research institutions. Though successful organizations, there were feelings of ambivalence about the ORR/Bureau from the beginning. Beyond occasioning the falling-out between Lazarsfeld and Mills, it was also famously the site for conflict between Lazarsfeld and the émigré Frankfurt School scholar Theodor Adorno, whose failed collaboration indexed far different understandings of the new media of the day. Their conflict provided one of the deep backgrounds for disputes in the 1970s and ‘80s between critical and objectivist approaches to media studies, when Lazarsfeld and the Bureau came under strong criticism for focusing the study of mass media too narrowly on short-term effects and for working too closely with the manipulative forces of marketing. Even those who did not break with Lazarsfeld had their own criticisms of the Bureau—for instance, about the tedium of testing laxative ads or other small commercial projects, the feeling of being co-opted into Lazarsfeld’s own projects, or the sexism of the Bureau’s hierarchy. From nearly its founding, the Bureau has been criticized, both externally and internally.